Owen Ogletree's notes on Winter Beers for 2008. This article first appeared in Athens Magazine. European brewing traditions often designate certain beer styles for specific seasons. When "Old Man Winter" arrives, many breweries around the world release winter beers - stronger, darker beers that sometimes include spices and offer a full body and warming finish. In England, "winter warmers," beers of deep, rich flavors and higher alcohol, have tempered winter’s chill and nourished frigid constitutions for centuries. If standard, yellow American lagers are comparable to a very light summer salad, then classic winter ales are akin to a hearty Christmas dinner. Many spiced winter brews may be reminiscent of spruce, nutmeg, cinnamon, gingerbread or Christmas cookies. These beers tend to have a sweet, malty profile and render very little bitterness. Special additions of fermentable sugars might include molasses, maple syrup, honey or candy sugar, and these ingredients certainly contribute pleasing aromas and flavors to beers such as Samuel Adams Winter Lager, Harpoon Winter Warmer and Anchor Christmas Ale. Georgia beer lovers consider the annual Festive Ale from Atlanta's own Sweetwater Brewing Company a perennial favorite. Available every winter in six packs, red wax-topped liter bottles and on draft, this luxurious, strong dark ale offers a subtle blend of allspice, caramelized grains and an alcohol content of around 8.5 %. Savor it in a brandy snifter alongside a slice of cherry cheesecake. Atlanta Brewing Company's 2007 winter offering, Double Chocolate Oatmeal Porter, exhibited a rich, full body and decadent chocolate notes from dark roasted malts. It was so popular, that the brewery is now offering it year-round. This year's winter brew is an 8.2% alcohol Belgian-style strong ale made with expensive Belgian specialty malts and Trappist abbey yeast. This dark brown beer is thick and malty with some currant/raisin sweetness and warmth from alcohol in the finish. One of the most anticipated annual winter brews comes from the Sierra Nevada Brewery in Chico, California. Celebration Ale boasts a rich, slightly sweet flavor balanced by robust, citrusy, aromatic hop flowers. No beer is better alongside a hearty pepper-crusted steak. Samuel Smith’s Winter Welcome, the original winter ale imported into the U.S.A., exhibits luminescent honey-gold colors, inviting flavors of caramel, creme brulee and biscuits, and an oaky hop bouquet. Winter Welcome is delicious with roasted ham, smoked turkey, stuffing and sweet potatoes. 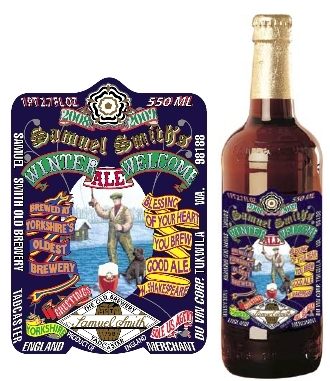 Samuel Smith's Brewery got its start in 1758 in Yorkshire, England. Their yeast strain has remained unchanged for over 100 years, and the brewery ferments its ales in historic stone "Yorkshire Squares" (vats made of locally quarried slate). All these qualities add to the history, complexity and appeal of Winter Welcome. The screen-printed artwork of Saint Nick on 22-ounce bottles makes it easy to spot Santa’s Private Reserve strong brown ale from Rogue Ales in Oregon. Packed with flavors of toffee, caramel and roasted nuts, this winter selection tastes more like a candy bar than a beer, and the tall bottle makes for a perfect stocking stuffer. Terrapin Beer Company, an Athens microbrewery located at 265 Newton Bridge Road, plans three varieties of winter beers this year. Wake-n-Bake Coffee Oatmeal Imperial Stout is a jet-black, 8.5% alcohol, viscous dark ale brewed with a special blend of coffee beans from Jittery Joe's. Also look for a very limited, oak barrel-aged, draft-only version of Wake-n-Bake that will carry a secret blend of flavors and spices. Terrapin's third winter offering, available only in 22 ounce single bottles, carries the name "Dos Cocoas." Chocolate lovers take note - this black Porter incorporates both cocoa powder and cacao nibs (fresh beans from Ecuadorian cacao trees). The quintessential location in downtown Athens to sample the widest selection of winter beers must be Trappeze Pub on Washington Street. This winter, Trappeze looks to pour rare draft versions of fruity, spicy, complex seasonal beers from Belgium including Corsendonk Christmas Ale, St. Bernardus Christmas, Affligem Noel and Delirium Noel. Co-owner Eric Johnson's intense enthusiasm for great beer compels him to stock the very best styles from around the world. "The amazing Belgian winter ales have a warm place in my heart because they are so elegant, satisfying and intensely flavored," stated Johnson. During holiday outings and travel, be sure to also visit local brewpubs for special winter beers on tap. Copper Creek in Athens, Max Lager's in Atlanta, Twain's Billiards & Tap in Decatur, and Five Seasons Brewing in Atlanta and Alpharetta all produce exciting, distinctive brews for the colder months. Brewers at these small restaurant/breweries benefit from the time and freedom to concoct beers unique and delightful enough to make anyone forget about eggnog and mulled wine.